A crane that slammed into the Sunshine Bridge has not only disabled the critical traffic artery but has disrupted the lives of thousands of people. Besides the loss of revenue for nearby businesses, students and faculty are having to grapple with commutes that are normally 15 to 20 minutes each way but are now lasting up to one hour per trip, forcing, in some cases, life-altering changes. Jacob Dunn, a 15-year-old sophomore at Ascension Catholic High School in Donaldsonville, said he is “making the best of the situation,” including living with his grandmother in Donaldsonville during the week. Dunn, a member of the Bulldogs football team, said practice doesn’t end until past 5:30 p.m., “so, I wouldn’t be home until 7:30 p.m. or 8 p.m. with traffic.” Add in homework and an hour earlier wake-up time for the trek back to school in the mornings, and Dunn would have had little time left just to be off the road. 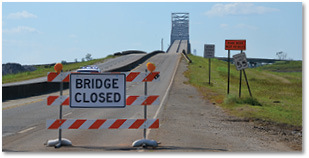 Without the bridge, commuters from the east bank of Ascension Civil Parish are traveling via the Veterans Memorial Bridge in Gramercy and along LA Highway 3127, a long stretch of two-lane roadway through acres and acres of sugarcane. According to Pizzolato, the commute is a major concern for parents with students who drive and are required to stay for after school activities. She also carpools with another school faculty member to help with gas expenses. By the second week, and with the bridge not scheduled to reopen until January at the earliest, Pizzolato arranged for a bus to transport participating students and faculty from the east side of the river to the school. Parents and some staff begin arriving at 6:30 a.m. at the pickup point to wait for the bus, which leaves promptly at 6:50 a.m. After school drop-off is 3:45 p.m. at the same location. Belinda Gros, a classroom aide at Ascension Catholic, lives on the east side of the river and rides the bus to school to help with the three- and four-year-old students. 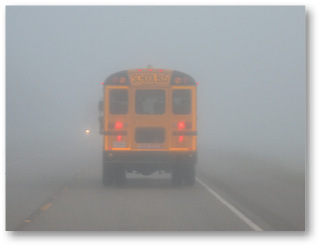 With its reflectors, strobe light and stop sign arms, the school bus was much more visible than other vehicles on the road during one foggy morning commute. The headlights of an oncoming car can barely be seen to the left of the bus. “We are very lucky to have her ride the bus to help with the little ones,” said Pizzolato. While school administrators are doing all they can to accommodate students, families continue to struggle with the two-hour daily commute and the toll it is taking on their children. “It’s affecting her because we have to wake up an hour earlier and by the end of the day she’s done,” emphatically stated Richelle Mitchell of Sorrento, whose daughter Rylee, 7, rides the bus. “It makes coordinating the pickups a little more difficult,” said Andre Belanger of Gonzales, who drives his sons Luc, 6, and Mathieu, 4, to the bus stop. He and his wife Ashley both work in Baton Rouge. “Now, one of us has to leave work earlier or we have to rely on a grandparent to come and get them, and so we have to leave work earlier to pick them up at their house,” Belanger explained. He said their sons used to stay in aftercare until 5:30 p.m. but that is no longer an option. Pizzolato said she has set up a satellite location at St. Anne’s Church in Sorrento for two days a week on the east side of the Mississippi River in order to give students, parents and teachers a break from the long commute. Thanks to technology, she said, learning remotely is a feasible option, with students live streaming classroom instructions. She said there will be three certified instructors along with two qualified parent volunteers on site to help coordinate the effort and students will bring their own lunch. As for Dunn and his family, they’ll continue to arrange their schedules to get together when they can on weekends. Jacob said his dad, Chad, commutes from Gonzales to the west bank for his job and brings 5-year-old Emma to school on those days. Jacob’s younger brother, sixth-grader Peyton, rides the bus from the bus stop and Jacob’s mom, Amy, works in Gonzales. In the meantime, Jacob catches rides from football practice with a student who lives next door to his grandmother’s house. And, living with his grandmother Monday through Thursday does come with some perks.